Other Thoughts: The default shipping is all I can describe as a WHAT moment. At first UPS picked up the package and had it here by Friday. Very fast. But on Saturday - after 2 destination scans - it sat there all weekend. (UPS delivers on Saturday!) But on Monday the status changed...to sending to post office. WHAT!!!??? As a result a product in my city on Friday never reached me until Tuesday!! And it still doesn't show as delivered on my order history. Come on Newegg -- is this your default free delivery??!! No thank you. 7 out of 8 people found this review helpful. Did you? Pros: - Fast and lots of GB for a boot drive. Other Thoughts: - Would definitely recommend buying. Other Thoughts: Purchased the 960 GB Micron version (Crucial's parent company) on Flash.Newegg.com for a few dollars less. 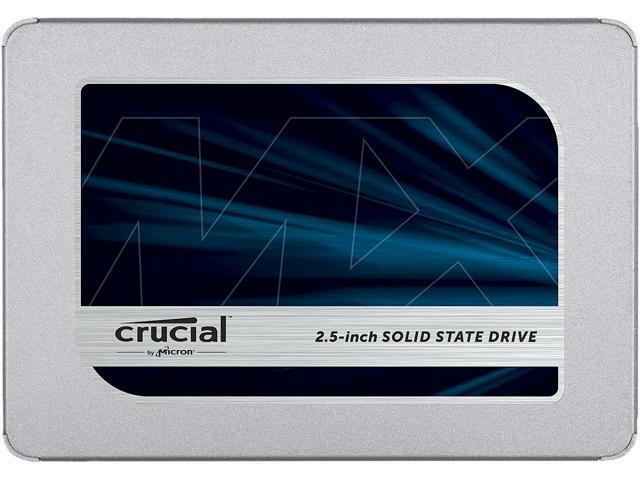 The MLC technology is a few years old, but my research led to me believing that MLC could last about 50% more R/W cycles than the newer 3D NAND, and this SSD comes with a 5-year warranty (from the reseller). The laptop I upgraded has SATA II, so the SATA III speed increase would not be realized by my system. Although the Acronis for Crucial SW cloned the SSD that booted after three BIOS POST restarts, would not load audio and Intel chip set drivers. Alternately used the Macrium Reflect 7 Free Edition, and after working on a 1 TB drive for 3 1/2 hours the the cloned SSD started first time with no problems at all. This SSD was about 30 GB smaller than the disk it replaced, and the Macrium Reflect 7 SW had no problems creating a clone with smaller partition sizes. A comment on the web said that EASEUS TODO (free) would also work better than Acronis, but I did not verify this. Pros: I put it in and set it up. I use this SSD to hold and run all of my programs, and games so that my M2 doesn't get loaded up. If I don't have a choice as to where a program is to be installed, then my C:\ Drive gets it. Cons: This drive to me is pricey but that's the nature of the beast right now. Pros: I splurged and bought an i7 with a decent video card and 16 gigs of ram, but it always felt kind of slow until now. Upgrading from a SSHD (1 TB of HD with 8 GB of SSD built in) has made a huge difference in boot times, load times, and everything else. My laptop feels more than new. Cons: I haven't noticed any problems yet. Other Thoughts: I'd absolutely suggest upgrading to an SSD. If you need a 1 TB drive the performance from this one is excellent.